Over a month after her show was cancelled, Roseanne Barr gave a tearful interview where she expressed her regret over the racist comments that she posted on twitter that lead to the cancellation. Less than a month ago, it was reported that the popular reboot for the 90's hit show Roseanna will be cancelled after its leading actress, Roseanne Barr, twitted several racist tweets. After the dust settled, ABC announced that the show will return, without Barr, who has since expressed her regret over her words. 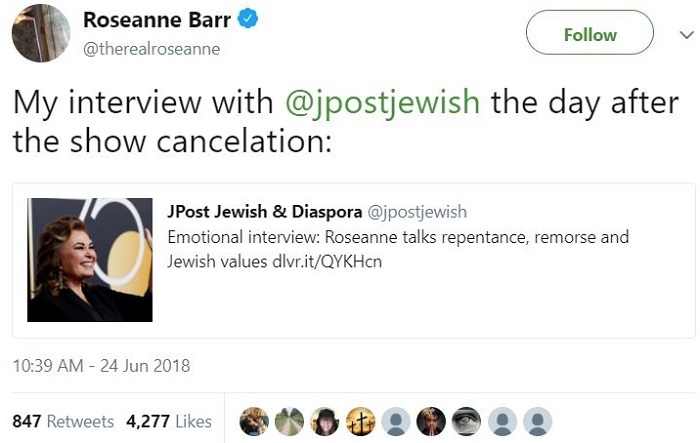 A day after her show was cancelled, Roseanne gave a tearful interview to her friend, Rabbi Shmuley Boteach, on his podcast. Barr tweeted the interview over the weekend and said "I'm a lot of things, a loud mouth and all that stuff, but I'm not stupid for God's sake. I never would have wittingly called any black person they are a monkey." Barr also stated that she was under the influence of Ambien when she wrote the tweet but stressed that is was not an excuse for her behavior, but an explanation for it. "I horribly regret it" she said, adding "I lost everything, and I regretted it before I lost everything," Barr said. "And I said to God, 'I am willing to accept whatever consequences this brings because I know I've done wrong. I'm going to accept what the consequences are,' and I do, and I have."